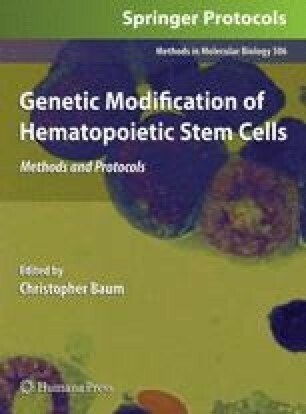 Genetic modification of peripheral blood T lymphocytes (PBL) or hematopoietic stem cells (HSC) has been shown to be promising in the treatment of cancer (Nat Rev Cancer 3:35–45, 2003), transplant complications (Curr Opin Hematol 5:478–482, 1998), viral infections (Science 285:546–551, 1999), and immunodeficiencies (Nat Rev Immunol 2:615–621, 2002). There are also significant implications for the study of T cell biology (J Exp Med 191:2031–2037, 2000). Currently, there are three types of vectors that are commonly used for introducing genes into human primary T cells: oncoretroviral vectors, lentiviral vectors, and naked DNA. Oncoretroviral vectors transduce and integrate only in dividing cells. However, it has been shown that extended ex vivo culture, required by oncoretroviral-mediated gene transfer, may alter the biologic properties of T cells (Nat Med 4:775–780, 1998; Int Immunol 9:1073– 1083, 1997; Hum Gene Ther 11:1151–1164, 2001; Blood 15:1165–1173, 2002; Proc Natl Acad Sci U S A, 1994). HIV-1-derived lentiviral vectors have been shown to transduce a variety of slowly dividing or nondividing cells, including unstimulated T lymphocytes (Blood 96:1309–1316, 2000; Gene Ther 7:596–604, 2000; Blood 101:2167–2174, 2002; Hum Gene Ther 14:1089–1105, 2003). However, achieving effective gene transfer and expression using lentivirus vectors can be complex, and there is at least a perceived risk associated with clinical application of a vector based on a human pathogen (i.e., HIV-1). Recently it has been found that oncoretroviral and lentiviral vectors show a preference for integration into regulatory sequences and active genes, respectively (Cell 110:521–529, 2002; Science 300:1749–1751, 2003). Additionally, insertional mutagenesis has become a serious concern, after several patients treated with an oncoretroviral vector for X-linked SCID developed a leukemia-like syndrome associated with activation of the LMO2 oncogene (Science 302:415–419, 2003). Naked DNA-based genetic engineering of human T lymphocytes also requires T cells to be activated prior to gene transfer (Mol Ther 1:49–55, 2000; Blood 101:1637–1644, 2003; Blood 107:2643–2652, 2006). In addition, random integration by electroporation is of low efficiency. We have recently reported that the Sleeping Beauty transposon system can efficiently mediate stable transgene expression in human primary T cells without prior T cell activation (Blood 107:483–491, 2006). This chapter describes methodology for the introduction of SB transposons into human T cell cultures with subsequent integration and stable long-term expression at noticeably high efficiency for a nonviral gene transfer system. This work was supported by a Grant-in-Aid of Research, Artistry and Scholarship from the Graduate School, University of Minnesota, the Minnesota Medical Foundation, the Children's Cancer Research Fund, the Alliance for Cancer Gene Therapy Young Investigator Award, the G&P Foundation for Cancer Research, the Sidney Kimmel Foundation for Cancer Research Kimmel Scholar Award, and the National Blood Foundation. X.Z. is the recipient of an American Society of Hematology Junior Faculty Scholar Award.